In late 1924, Richard Pettigrew began searching for a sacred boulder to add to his museum. He had heard about a large rock with symbols on it called Medicine Rock, located near Gettysburg, South Dakota. Pettigrew wanted to acquire a similar rock with symbols on it to preserve and display in Sioux Falls. He sent a request to E.S. Peterson of Mobridge and J.W. Parmely of Ipswich to begin looking for a suitable piece. A large boulder was found by Peterson with several large hand prints, but he estimated the boulder as weighing 15 to 20 tons. Pettigrew believed that it was too large to transport to Sioux Falls and requested that the search continue for a smaller boulder. Eventually, this three-ton example was found on a ranch near Evarts, South Dakota. The ranch belonged to J.J. Bentz, but was being rented by Ed Klein. 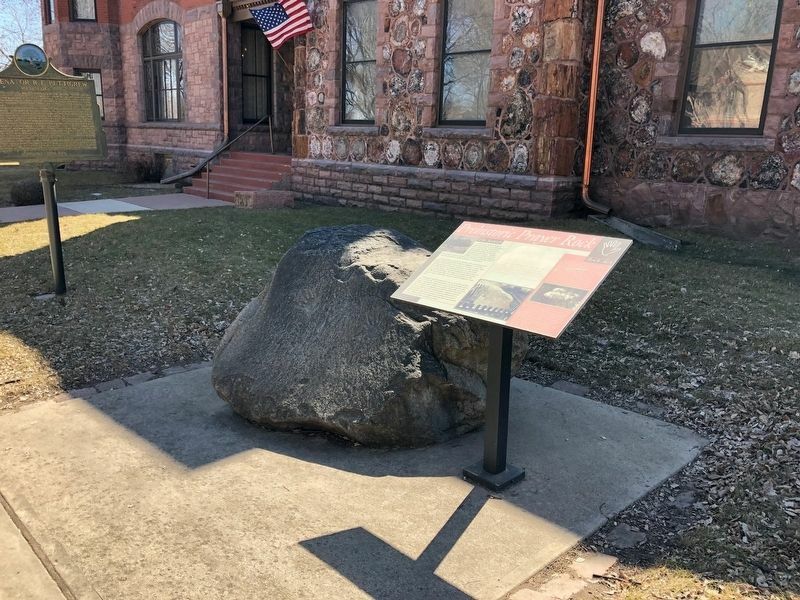 Mr. Pettigrew purchased the boulder from Bentz and hired Klein to remove and transport it to the railroad station at Mobridge, where it would be shipped to Sioux Falls. the boulder was by using a 15-horsepower engine and leverage to pull it up, but after four hours they hadn't made much progress. Eventually, it took six men, two wagons, and eight houses to pull the boulder free from the earth and move it to the railroad station. Pettigrew paid Mr. Klein and his team $75 for their work, and an additional $75 to transport the boulder from the depot to his home once in Sioux Falls. Pettigrew placed the boulder outside his move and museum in 1925, and it has been on exhibit ever since. In 1925, a man asked a Sioux Elder how old the carvings on this type of rock were. The reply: My grandfather was a very old man when I was a little boy. When he was a little boy the rock was just the same (already carved)." R.F. Pettigrew correspondence, Jan 11, 1926. Rock art has been recorded in this region since early exploration by whites. References to it appear in the journals of such explorers as Pierre de la Verendrye, Lewis and Clark, and Prince Maximilian. Because of the regions past residents, areas of North Dakota and northern South Dakota have been likelier places to discover this unique style to art. Experts do not agree as to exactly when rock art work was created, who used it, or why it was made. Further investigation and examination has found that tribes such as the Sioux, Mandan, and Hidatsa all have a history with the spiritual power of rocks. "Prayer rocks," such as this one, are carved with images of people, animals, hoof prints, hands, and feet. Unlike pictographs where images are painted onto the surface, these shapes are characterized as petroglyphs because the images are carved into the stone. Many early recordings of prayer rocks describe them as being painted with a red ochre paint. This rock may have been painted read at one time, mixing pictographs with petroglyphs. The carvings on this boulder are of adult hands and a child's foot. The open hand was sometimes a symbol of peaceful living and open spiritual prayer. Location. 43° 32.911′ N, 96° 44.098′ W. Marker is in Sioux Falls, South Dakota, in Minnehaha County. Marker is on W 8th Avenue 0.1 miles west of S Duluth Avenue, on the left when traveling west. Touch for map. Marker is located at the Pettigrew museum. Marker is at or near this postal address: 623 W 8th Street, Sioux Falls SD 57104, United States of America. Touch for directions. Other nearby markers. At least 8 other markers are within walking distance of this marker. U.S. Senator R.F. Pettigrew (here, next to this marker); Quartzite Paving Stones (approx. 0.2 miles away); The Hanging of an Innocent Man (approx. 0.4 miles away); Divorce Capital (approx. 0.4 miles away); Cigar Manufacturing (approx. 0.4 miles away); President Woodrow Wilson (approx. 0.4 miles away); Dakota Iron Store (approx. 0.4 miles away); Fort Dakota, D.T. (approx. 0.4 miles away). Touch for a list and map of all markers in Sioux Falls. More. 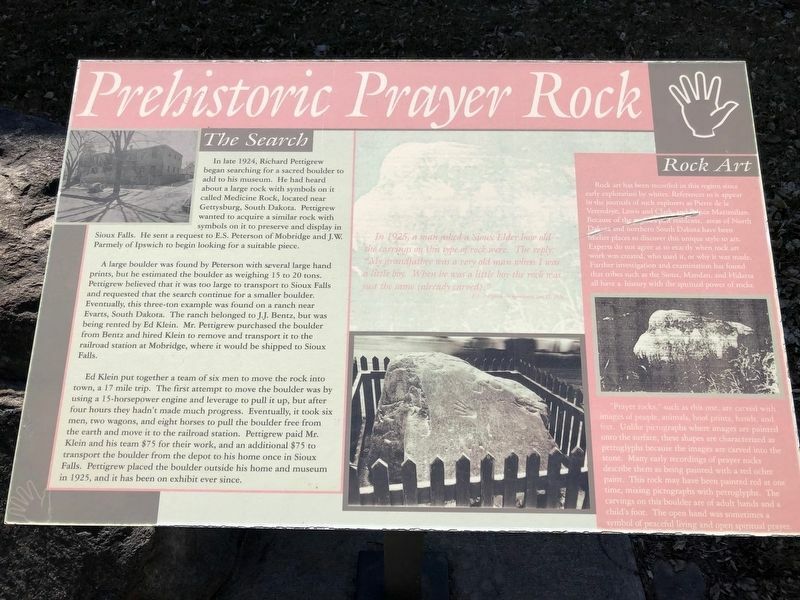 Search the internet for Prehistoric Prayer Rock. Credits. This page was last revised on April 13, 2019. This page originally submitted on April 10, 2019, by Ruth VanSteenwyk of Aberdeen, South Dakota. This page has been viewed 30 times since then. Photos: 1, 2. submitted on April 10, 2019, by Ruth VanSteenwyk of Aberdeen, South Dakota. • Andrew Ruppenstein was the editor who published this page.